The ovaries are two small organs, one on each side of a woman's uterus. The ovaries have follicles, which are tiny sacs filled with liquid that hold the eggs. These sacs are also known as cysts. Each month the follicles grow, mature and rise to the surface of the ovary where they rupture and release an egg so it can travel through the fallopian tube for fertilization. When the egg leaves the follicle, ovulation takes place. This process is controlled by pituitary hormones. The remnants of the ruptured follicle then begin to produce progesterone, which stimulates the lining of the uterus called the endometrium to grow thicker in anticipation of a fertilized egg. The increase in progesterone production is to signal it to stop stimulating the development of eggs. In polycystic ovaries, the follicles grow just under the surface of the ovaries and are produced again and again because the pituitary has not been signaled to shut off. Both the ovaries become filled with tiny cysts arranged around the periphery of the ovary and become enlarged. The covering of the ovarian capsule thickens causing difficulty in the release of the egg. Polycystic ovaries are quite common; about one in four women have them. In about 7% of the women having polycystic ovaries, symptoms of hormonal imbalance such as menstrual irregularities, excessive weight gain, acne, abnormal hair growth, etc. are seen. Without progesterone, the menstrual cycle becomes irregular or totally absent. But the cysts continue to produce male hormones, which continue to prevent ovulation and lead to the appearance of male characteristics. This condition is called 'polycystic ovarian syndrome'. Technically speaking, they are not cysts which are fluid-filled sacs, but very small egg follicles. Polycystic ovaries without polycystic ovarian syndrome may be due either to normal variations, or the conditions that lead to multiple ovarian cysts. It is not entirely clear why some women with polycystic ovaries are symptom-free while others seem to have a plethora of symptom or are badly affected by one symptom in particular. It is possible that polycystic ovaries are an inherited condition. However the factors that influence the development of the symptoms include environmental factors such as diet and weight as well as lifestyle. 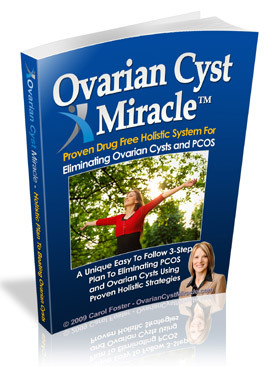 Since environmental and lifestyle factors could influence the manifestation of the condition, it is highly recommended that polycystic ovaries when detected be treated with holistic medicine. The presence or absence of symptoms will not affect the treatment as it takes into account the body as a whole, a sum total of all physical, mental, psychological, emotional as well as spiritual components. A healing of all these component parts will result in a healthy being.